As the snow melts away, NASWA Resort opens it’s doors as the flowers break through the thawing ground, and the gushing waterfalls and trees come alive again. Spring in the Lakes Region is an excellent way for you to explore the great outdoors again. Whether you’re looking for a family lakeside vacation or a romantic excursion, we’ve got the perfect place for you to stay, right on the shores of Lake Winnipesaukee. Winnipesaukee Scenic Railroad is located in the heart of the Lakes Region. Take one of their excursions along the western shore of Lake Winnipesaukee, choose from one or two-hour tours in a restored vintage coach. Board the train at the central station in Meredith or leave from Weirs Beach Station as you take in the beautiful sight of Winnipesaukee scenic railroad. Weirs Beach beckons with its boardwalk, train rides, and family amusements. The Lakes Region is home to five different wineries, making for an ideal wine getaway. Visit Hermit Woods Winery in Sanbornton, for both tours and tastings, or the Gilmanton Winery, which has a delightful restaurant and Camelot Alpaca Farm, for the kids to have fun while you sip on a fruity blend. We also recommend spending at least one night on the shores of our Lake to see the breathtaking sunset over our NASWA Resort. The Lakes Region is a prestigious part of New Hampshire, where the only stressful decision to make is what’ll be the next lake activity. With hundreds of lakes, ponds, and beaches, you’ll find plenty of opportunities to rest and reconnect with your loved ones, as you break your routine. Lake Winnipesaukee is the largest lake in the state. The mountain ranges and wooded shorelines that surround this lake make it an ideal romantic destination. For a unique experience, visit the iconic Castle in the Clouds. Perfect for a day with the whole family, whether you’re chasing summer thrills or a family fun getaway, NASWA Resort is the ideal spot for your next trip to the Lakes Region of New Hampshire. Book your stay with us today! Chances are you’ve recently woken up checked outside your window only to see another gray, snowy, winter day. At that point, you were ready to cancel all your plans and stay in bed. Winter is also a reality for us in Laconia New Hampshire, so here at the NASWA Resort, we understand. It’s diagnosed as a seasonal affective disorder, more commonly known as the winter blues. But don’t worry we’re here to help with a list of fun ways to battle the gray weather! If you’re desperately looking for a change of scenery, try our colorful website and start researching all the great things to do in the Lakes Region NH. Take advantage of your time inside to learn something new! Try playing a new card game, or maybe cook up a tropical meal for dinner. If you don’t have to face the reality of the weather outside, don’t! Yes, we’re telling you to stay in your comfy and warm house to daydream of lazy lakeside days. You can pretend like it’s sunny and 70, in the middle of a snowy blizzard. Just look up the NASWA Resort, and dream on, but make sure to book your summer getaway to Laconia New Hampshire. Dark colors and dark clouds aren’t part of the winter blues battle gear. So, bring out those bright colored clothes and show this gray weather who’s boss. Although there’s no scientific correlation between feeling optimistic and wearing bright colors, we’re pretty it secretly tricks your brain into thinking its Spring. If you’re having a hard time check out our colorful website, and start planning your summer getaway to one of our bright and colorful cottages. Get the credit cards ready and start shopping for colorful summer attire for your quickly approaching Laconia New Hampshire getaway. Who knows you may even want to book a Lake Winnipesaukee cruise to take in the picturesque scenery surrounding our beautiful property. After sharing our winter blues battling rules, we’ll see you and the sun at the NASWA Resort very soon! The NASWA Resort features beautiful amenities in a central Laconia location, with a perfect room for every guest. Choose one of our colorful cottages and let yourself daydream of tropical vacations as you sunbathe on the shores of Lake Winnipesaukee to a tropical island. When it comes to finding places to stay Lake Winnipesaukee NH, we have you covered between all of our varied accommodations. Our Inn and Suites feature rooms with king-sized beds and two full beds. We recently upgraded the bedding to highlight comfort and convenience. All rooms come equipped with a phone, flat screen TV, mini-fridge and will also have to air-condition. Our Inn building features rooms with a king sized bed and two queen beds. These will also have air conditioning, and be equipped with the same amenities, in addition to a balcony with a view of Lake Winnipesaukee and a coffee maker. Our Paugus Suite features three bedrooms. One with a king-sized bed, private full bath and balcony, and two additional rooms with two queen beds in each. Another full bath, the living area can accommodate extra guests thanks to the sleeper sofa. There is a fully functional kitchen, air conditioning, a phone, and flat-screen TV. The main benefit of our Paugus Suite is the balcony with spectacular views of Lake Winnipesaukee. Our AquaVista buildings feature rooms with king-sized beds and two full beds. All rooms feature air conditioning, mini-fridge and coffee pots. As well as a phone and flat-screen TVs. Our AquaVista Beachfront rentals feature the same amenities as well as a private patio area facing the parking area. Our eighteen cottages are uniquely designed to host each unique family and guest that comes to our Lake Winnipesaukee resort. Choose from one or two bedrooms. Most of our cabins overlook the Lake and offer the comforts of home. Our one-room cottage features an open floor plan with two full beds and can accommodate up to four guests. Other amenities include a refrigerator, microwave, kitchenette, and flat-screen TV. Our two-bedroom cottages are large enough to sleep up to 6 guests, two guests per bedroom and two more in the living room which has a sleeper sofa. Enjoy a full kitchen and a screened-in porch, as well as daily trash and towel service. Book a week-long getaway to The NASWA Resort’s colorful cottages this summer, and you’ll feel like you traveled to a tropical island during your trip to New Hampshire. There’s plenty to do all summer long at The NASWA Resort. Whether you’re looking for a lakeside getaway or a great place to gather with friends and family to share a delightful meal, you’ll make memories to take home and treasure for years to come at our beautiful resort. From our new dock to our lakeside attractions, the NASWA Resort will keep visitors of all ages entertained throughout their stay! Our on-property amenities will have you booking your next visit, while you’re still on our property. Stroll along the longest private beach on Lake Winnipesaukee as you enjoy lake life or grab a cocktail from the NazBar & Grill. Our private beach is reserved for our guests, we offer the perfect spot for a flawless tan, or to just relax lakeside. Being the longest sandy beach on Lake Winnipesaukee, there are plenty of things to do, and space for you to find your happy place. The NASWA Resort, offers many perks, such as our complimentary dock space for guests. When you book your stay at The NASWA Resort, you’ll receive priority. Come check out NASWA’s new docks and dock lights this summer. You can also embark on a sunrise kayak cruise or another one of our various complementary activities. Just in case you have to do a little work while you’re on vacation, we offer complimentary WiFi for our houseguests throughout the resort. 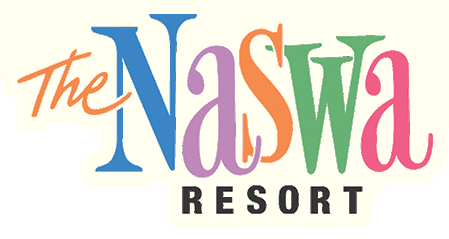 The NASWA Resort has partnered with favorite local businesses to give you discount access to local attractions. Your summer getaway is one click away, at The NASWA Resort book your stay today for the best price. Whether you’re looking for an adventurous weekend, a romantic getaway or a quiet break from your daily routine, The Naswa Resort is the place for you. When you plan on visiting our beautiful The NASWA Resort, you’ll discover all the fun things to do in New Hampshire! From watersport fun to finding quirky shops in town, you’ll never be bored. Our cozy accommodations will host anything from adventurous weekend stays to a peaceful, romantic getaway, even a family trip on the shore of our beautiful Lake Winnipesaukee. Lake Life Lessons, also known as L3, offers great coaching for various watersports. They are conveniently located on Lake Winnipesaukee. Whether you’re interested in trying a watersport for the first time or testing your skills against professionals. L3 has both the passion and skills to help you excel and reach your fullest potential. L3 encourages everyone, regardless of ability and age, to come out on the lake. Families, couples, and groups of all sizes are welcome to join the fun for an exciting summer on the water! Shopping in Laconia, NH is a unique experience, and you’ll find exciting and unique shops. Such as the Laconia Antique Center, which offers a remarkable selection of Glassware, Jewelry, Vintage Toys & Trains, and more. As you walk through the neighborhood, you’ll find the Studio on Main Street in Laconia and grab a cup of coffee at Wayfarer Coffee Roasters; all near the Laconia Antique Center. Of course, you’ll want to check out our NazShop to find the perfect souvenir, so you can forever remember your Lake Winnipesaukee vacation. When it comes to things to do in New Hampshire, The NASWA Resort is the resort for your New Hampshire getaway. Book your summer trip today to get the best spot on Lake Winnipesaukee. You’ll enjoy your best summer yet!